Heat oil in large skillet over medium-high heat and brown chops about 1 minute on each side. Add remaining ingredients to pan, stirring to blend. Cover and simmer for 5-8 minutes, until chops. 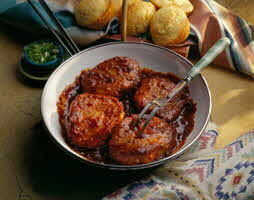 Serve these saucy chops with warm dinner rolls and deli cole slaw.